Of the more than 200 LAPD officers who have died in the line of duty, more than half have been victims of gunfire. In nearly every case, their killer was either captured or killed. Five cases, however, remain officially open and unsolved. In the first case, on April 8, 1910, Officer David Brooks was shot and killed by two robbery suspects near the intersection of 30th Street and Grand Avenue. On March 18, 1928, Officer James Carter stopped two men at Alpine Street and Grand Avenue and started to frisk them when one of the men pulled a gun, shot and killed the officer. On April 13, 1930, Officer Peter Muller Jr. reported that he was following a car containing suspected bootleggers, and was found shot on South Flower Street. He died shortly after. On Sept. 9, 1972, Officer Fred Early was shot while chasing a burglary suspect near the intersection of Sawtelle and National boulevards, and died of his injuries about five months later. In each of those cases, the killer or killers haven't been identified or caught. The fifth unsolved case is more mysterious and puzzling, with many more questions than answers. 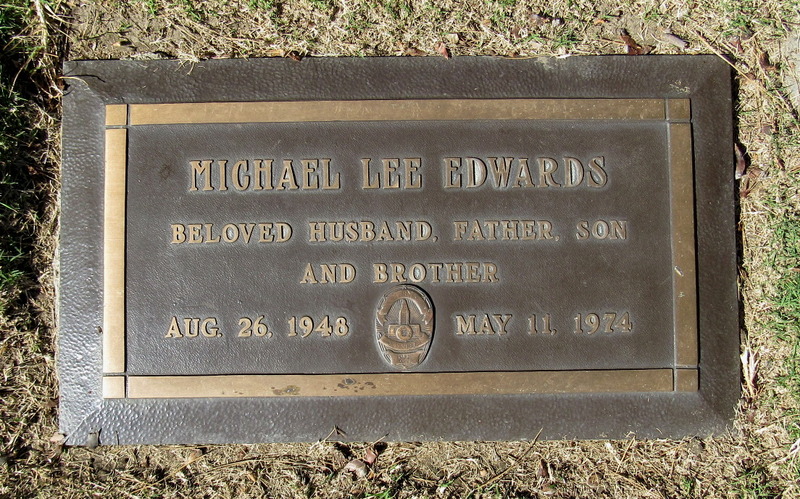 Officer Michael Lee Edwards joined the LAPD on Sept. 8, 1969, three years after he graduated from high school in Long Beach and less than two weeks after his 21st birthday. He was a patrol officer working out of the 77th Street Division, and had been temporarily assigned to a gang taskforce called CRASH -- Community Resources Against Street Hoodlums. After finishing his shift on Friday, May 10, 1974, Edwards went to the bar at the Police Academy in Elysian Park, where he gathered with fellow officers and celebrated the end of his CRASH assignment, and the beginning of his vacation. Shortly after 10:30 p.m., Edwards left the Police Academy and headed, he said, to Long Beach, where he lived with his parents. The next morning, shortly before 9 a.m., two teenage brothers were on their way back from the grocery store to their home on West 89th Street, in South-Central Los Angeles. They took a shortcut down an alley, behind a burned-out and vandalized apartment building. Inside the shell of the building, they saw a man lying on his back, motionless, with a red jacket covering his head. They asked the man if he was OK, but got no response. They walked closer, saw a pool of blood on the ground, and ran the rest of the way home. Edwards had been shot six times at close range with a .9-millimeter handgun, including several times in the back of the head. His hands were cuffed behind him, with his own handcuffs. His wallet, his car -- a 1972 gold Ford Pinto -- and his .38-caliber service revolver were all missing. The next day, Edwards' car was found at 186th Street and New Hampshire Avenue, about eight miles south of where his body was found, at a popular drop spot for stolen cars. Edwards was buried at Forest Lawn Memorial Park in Cypress. More than 1,000 people, including an estimated 650 uniformed officers, attended the service. Detectives considered a possible motive for the crime: Was Edwards kidnapped and killed during a robbery, after the robbers realized he was a police officer? Was he kidnapped and killed because he was a police officer? Was his death related to any particular cases he had been working on? Was it just a totally random, irrational crime? Or was it something else? More than 40 years later, all of those questions remain officially unanswered. Edwards was born Aug. 26, 1948, in Southern California, the second of three children. His father was a car salesman. On Dec. 22, 1966, Edwards married Penney Sue Lockerby in Los Angeles. Both the bride and the groom were 18. The couple's first child, a daughter, was born in 1968. Their son was born five years later. Over the 40-plus years after Edwards' body was found, the case has been reviewed, reopened and reinvestigated. Billboards have been posted seeking information, rewards have been offered, detectives and investigators reviewed reports and studied evidence, visited 10 states, tested more than 100 guns and interviewed more than 1,000 people. Fingerprint and DNA evidence has been checked and re-checked. And still no answers. But there have been a few breaks, and new information. In 1981, Edwards' service revolver was found in Las Vegas. A woman who saw a gun safety message on television brought the gun, which had been given to her by a friend, to the police station. LAPD detectives interviewed the woman and her friend, and determined that they had no link to Edwards' murder. Although detectives initially focused on Edwards' police work, later investigations considered the possibility that the murder may have been more personal. In 1974, Edwards and his wife were having marital problems, and had separated. Edwards moved in with his parents in Long Beach, and divorce papers filed by his wife were found on the passenger seat when his car was recovered. At the time of his death, Edwards was dating an unmarried police dispatcher, who had just broken up with another LAPD officer. He was also friends with another woman who worked near the 77th Street Division, and was recently married. Detectives questioned all of the people involved in those relationships, and decided that none of them were involved in Edwards' murder. As the years and the decades pass, memories fade, witnesses move away or die. Edwards' parents died, never knowing who killed their son. His older brother died. His wife remarried, and died in 2008. Edwards' daughter has a Facebook page, In Memory of Slain LAPD Policeman Michael Edwards, dedicated to keeping her father's memory and spirit alive. A group of Edwards' friends from high school and the LAPD have also launched a webpage, MichaelLeeEdwards.com, with news, information and updates on the case. If you have any information about the murder of Officer Edwards, call the LAPD Robbery-Homicide Division's Cold Case Homicide's Special Section at 213-486-6810, or report tips online at www.LACrimeStoppers.org. Edwards' sign is located on the west side of Main Street at 89th Street.